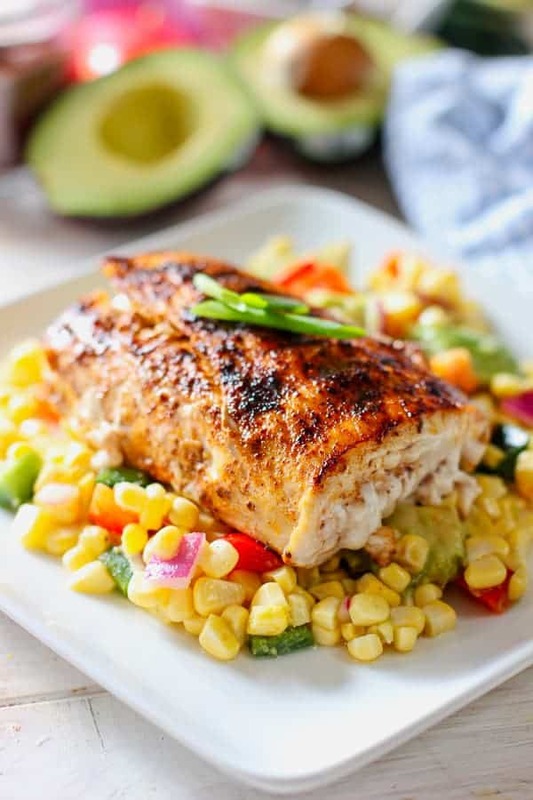 TENDER FLAKY MAHI WITH A CRUNCHY FRESH CORN SALAD. GET THIS DELICIOUS MEAL ON THE TABLE IN ABOUT 30 MINUTES! We are always trying to find ways to work more fish into our diet. This recipe has become a staple. Not only in the summer time but anytime since it can be grilled indoors or out! Grilling outdoors – a whole new concept for this girl. I am scared of our big bad BBQ and never touch it. (I have a fear of plumbing too but that’s a whole ‘nother story). Facing my fears head on. To date I have grilled three, yes, three days in a row! I can not say I am completely at ease, but I can turn it on, hit the button and I don’t jump as high as I used too. Thats something. The perk is I can bang out some pretty tasty foods while dealing with my demons. 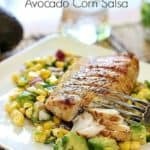 This Grilled Mahi with Avocado and Corn Salsa is incredibly easy to make and fabulously fresh. Fresh is so much easier to prepare then processed. It only took 25 years for me to figure out that one. 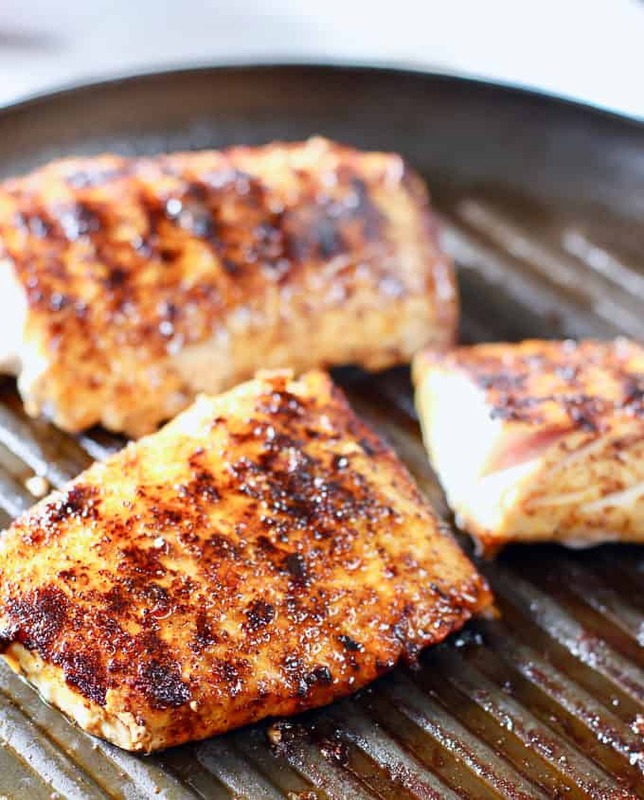 This Mahi has a simple olive oil and spice combination that is brushed on right before grilling. And the corn salsa requires NO COOKING! WE LOVED THIS CORN SALSA SO MUCH WE GAVE IT IT’S OWN POST! You can see Corn and Avocado Salad with Honey Lime Vinaigrette here! 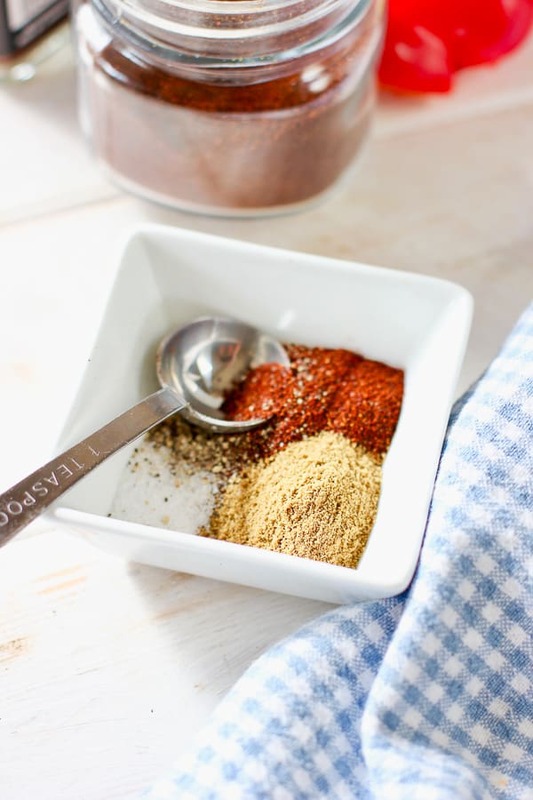 Mix your simple spice ingredients. Cumin, chili powder, olive oil, salt and pepper. 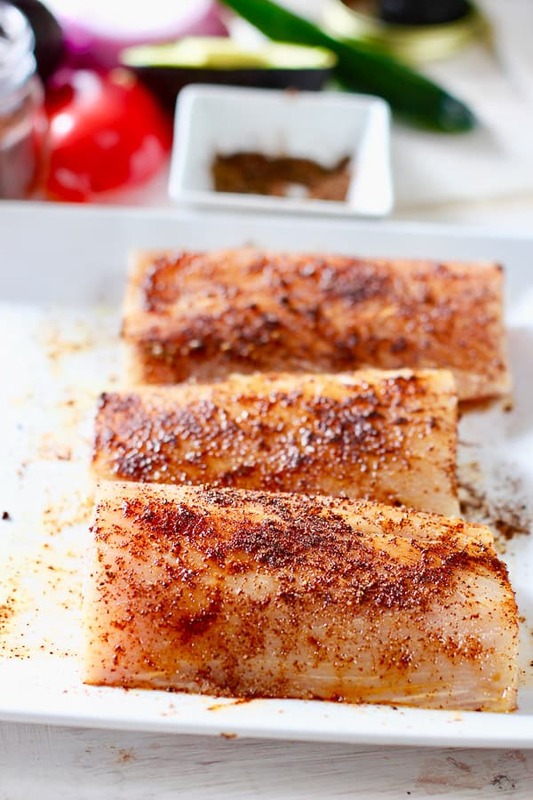 Pat dry your fish fillets before rubbing with the spice and olive oil mixture. This is important. You don’t want to saute your fish, you want to sear it. Too much moisture in the fish and it will ruin your perfect sear. CAN I USE CHICKEN INSTEAD OF FISH FOR THIS RECIPE? Yes, yes and yes! Use boneless chicken breasts or thighs and sear until the internal temp reaches 165 degrees. When it’s too chilly to BBQ, which is pretty darn often in Seattle. 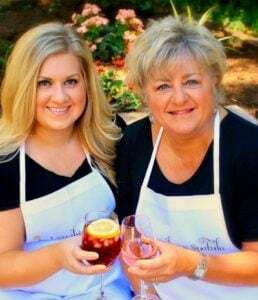 I break out our fave indoor grill pan! A cast iron would work really great as well. We love this Lodge brand. HOW DO I KNOW WHEN MY FISH IS COOKED PERFECTLY? Fish is cooked perfectly when the internal temp reaches 145 degrees. I use this hack every time I need fresh corn. It keeps all the corn in the bowl instead of on the counter and floor! Simply invert a small bowl inside a large bowl. A small ramekin works great. 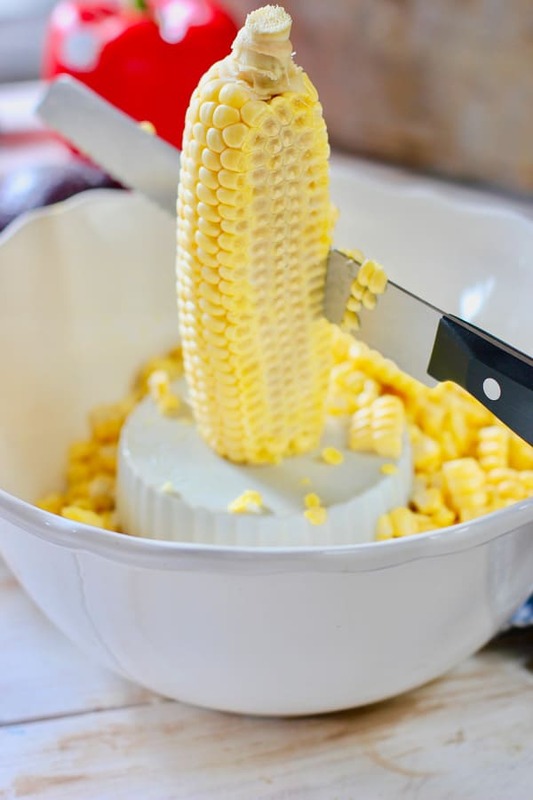 Set your corn on the flat side and slice kernels off with a serrated knife. Boom! Everybody in the bowl! WHAT OTHER KIND OF VEGGIES COULD I ADD TO MY CORN SALSA? If you like more heat, mince up a jalapeño. Zucchini and tomatoes would be fabulous as well. Any fresh veggie you have hanging around can be tossed in with the corn! Toss your fresh uncooked corn salsa with just a bit of sugar and vinegar to bring out the crunch of the corn and dinner is done! 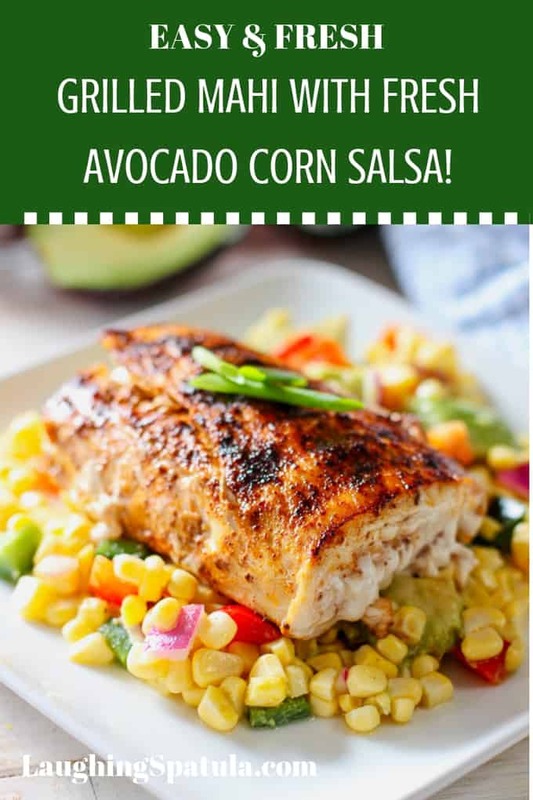 Serve your grilled fish on top of your fresh crunchy corn salad for a super healthy and easy meal! Left over corn salad? It is delicious with our Fresh Salmon Burgers! Off to slay more BBQ dragons! Hi CR – so glad you loved it! Thanks for the nice note! any suggestions/modifications if I were to do it on a cast iron skillet? Too cold for grilling this week! Simply follow the directions and sear on each side until cooked through in the middle. YUM! Love seared Mahi! 3-4 minutes on each side should do it…but check! I followed this recipe to a T and we loved every bite of it. I loved the salsa so much, I made it again the next day to take to a cookout with chips! AMAZING RECIPE! Thank you for posting it! Hi Kallie! I am so glad you loved it! This is on my list of recipes to up-doo with new pics. Stand by! This was delicious for both the adults and kids in the family. I cooked the corn & left the poblano peppers on the side for people to add if they wanted to. I think red pepper could be substituted to make it more kid friendly. Hi Pamela! 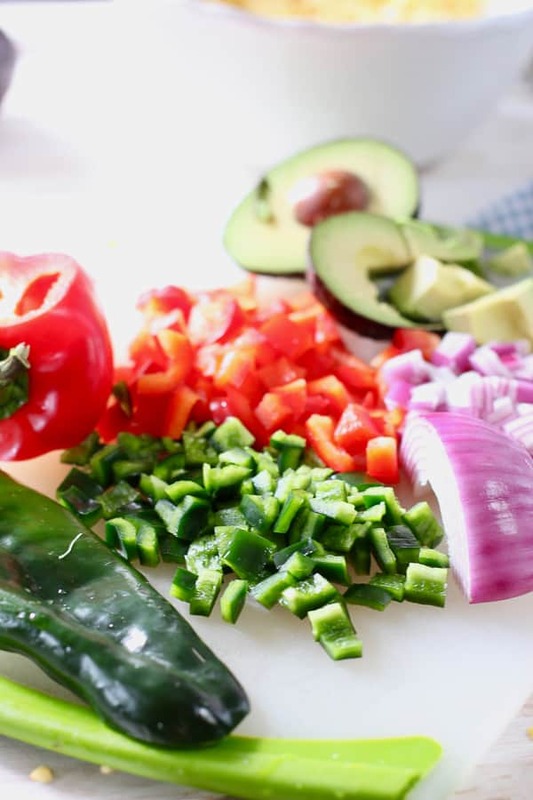 Agree, red pepper would be a perfect sub for the poblano and would add a nice pop of color! I am so glad you liked it and thanks for the note!